Bad Aura Colors: Do Dark Colors Indicate A Bad Aura? Are Dark Aura Colors Bad? Aura Camera / Blog / Are Dark Aura Colors Bad? People are often alarmed when they learn how to read auras and chakras and learn that their own aura imaging interpretation shows dark, intense colors. They believe that dark colors are bad and shouldn’t exist in their auras at all. While some dark colors and patches are bad, not all of them are harmful. In fact, some dark aura colors actually represent traits and qualities that would help you endure the trials of life and succeed. In this aura color guide, we’ll explore some dark colors that are present in the aura and what they mean. Some people view violet and purple auras as dangerous or toxic, but that’s not the case at all. In the light spectrum, violet or ultraviolet is the light of the highest intensity. 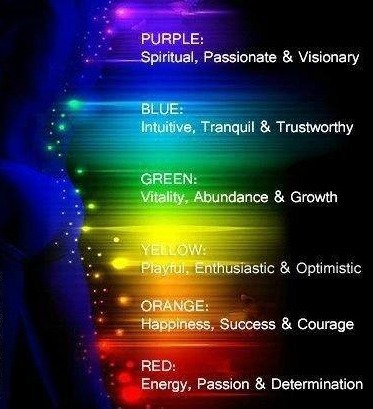 In the world of auras, dark violet color means high levels of spiritual energy and awareness. People with this aura are very open-minded, vibrant, creative, and original. This isn’t a bad aura reading color. It’s rare for anyone to interpret dark blue negatively. Blue is the color of the sea, the sky, and life-giving water. In the world of auras, indigo or dark blue is a color of perception and foresight. People who emit this aura are highly intuitive and are often great psychics and aura readers themselves. It’s only second to violet in terms of intensity and vibrations. This is another dark aura reading color that can be misinterpreted. Green auras can be very dark or very light, based on the nature of the person. When it’s dark, it almost appeared to be dull black, which can throw off amateur aura readers. Green isn’t a bad color. In fact, it represents life and growth and vibrates with the beating of your heart. People who have this color in this aura are generally very calm and compassionate. They tend to be healers or teachers. Any profession that requires compassion, nurturing, and love is usually the domain of people with green auras. The most intense the color is, the more successful they’ll be in their chosen professions. Red is synonymous with passion and represents the physicality of a person. People with dark red auras are passionate, determined, active, and very energetic. In fact, they’ll find it very hard to sit still and want to be constantly on the move. They’re also very courageous and bold and often leap forward before they think of the consequences. Red aura reading color is often found in chefs, soldiers, EMTs, police officers, adventurers, celebrities, etc. This color isn’t as connected to the spiritual aspect of auras as other dark colors mentioned above. As you can see, dark colors aren’t always harmful. However, that doesn’t mean you should ignore the presence of dark spots in your aura. Muddy brown or black patches can be a sign that you’re not at your best and should be addressed immediately. If your aura is clouded and has patches, we recommend you get an aura cleansing done and remove those dark spots. Meditation, salt baths, and other such treatments can help you recover.